Penelitian - With the direst environmental warnings yet still ringing in their ears, nations gathered in Poland Sunday for a UN summit aimed at heading off the "urgent threat" of runaway climate change. The UN talks come at a crucial juncture in mankind's response to planetary warming. The smaller, poorer nations that will bare its devastating brunt are pushing for richer states to make good on the promises they made in the 2015 Paris agreement. "Climate change impacts have never been worse. This reality is telling us that we need to do much more," Patricia Espinosa told journalists after Sunday's first negotiating session. "The impacts of climate change are increasingly hard to ignore. We require deep transformations of our economies and societies," said the statement. 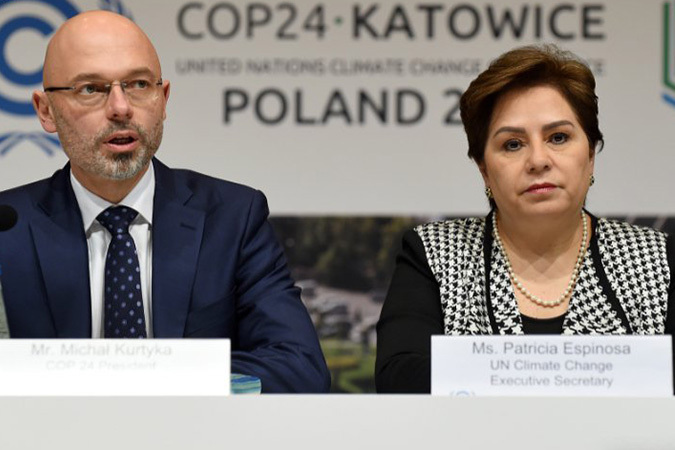 At the COP24 climate talks, nations must agree to a rulebook palatable to all 183 states who have ratified the Paris deal. This is far from a given: the dust is still settling from US President Donald Trump's decision to ditch the Paris accord. G20 leaders on Saturday agreed a final communique after their summit in Buenos Aires, declaring that the Paris Agreement was "irreversible". But it said the US "reiterates its decision to withdraw" from the landmark accord. The UN negotiations got off to a chaotic start in the Polish mining city of Katowice Sunday, with the opening session delayed nearly three hours by a series out last-ditch submissions from countries. Even solid progress on the Paris goals may not be enough to prevent runaway global warming, as a series of major climate reports have outlined. Brazil's strongman president-elect Jair Bolsonaro, for one, has promised to follow the American lead during his campaign. Even the most strident climate warnings -- spiralling temperatures, global sea-level rises, mass crop failures -- are something that many developed nations will only have to tackle in future. A key issue up for debate is how the fight against climate change is funded, with developed and developing nations still world's apart in their demands. Poorer nations argue that rich countries, which are responsible for the vast majority of historic carbon emissions, must help others to fund climate action. "Developed nations led by the US will want to ignore their historic responsibilities and will say the world has changed. The question really is: how do you ensure that ambitious actions are done in an equitable way?" said Meena Ramam, from the Third World Network advocacy group.